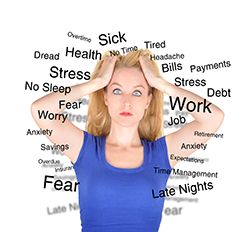 The World Health Organization says “stress is the health epidemic of the 21st century” and is estimated to cost American businesses up to $300 billion a year. Nearly half of all workers suffer from moderate to severe stress while on the job. According to one of WHO’s recent surveys, 66% of employees report that they have difficulty focusing on tasks at work because of stress. In addition, employees claim that stress was responsible for errors and/or missed deadlines, trouble getting along with co-workers/superiors, missed days, lateness, etc. How does stress happen in our bodies and is there anything good or useful about it? How can anyone be on their “A game” with this going on? In addition to all of these issues, people also have “limiting beliefs” that are in their sub-conscious minds preventing them from being effective or operating at maximum performance. Some examples are “I’m not good enough”, “They won’t like me”, “I’m not good at sales”, “I can’t trust people so I can’t delegate anything”, “I’ll never have enough money”. What can you expect for your business by using EFT? How and why does EFT make a positive difference?